For over 40 years, Crown Trade’s Timonox flame retardant system has played a key role in fire safety within the social housing sector – slowing down the spread of fire, allowing more time for buildings to be evacuated. The system can help social housing providers bring premises up to the required safety standards of relevant legislation, including the Regulatory Reform (Fire Safety) Order in England and Wales and The Fire (Scotland) Act 2005. 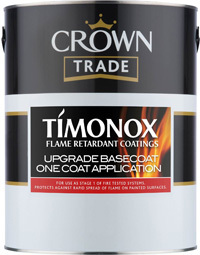 Crown Trade Timonox can rectify hazardous environments. The flame retardant coating system can be applied to decorate and protect interior walls and ceilings; or applied over multiple layers of conventional paint to upgrade the fire safety of existing housing stock. An advanced Crown Trade Timonox will be shocased at CIH Housing 2015 from 23rd – 25th June. Within the PFH Live area, representatives from Crown Paints will be explaining how they have utilised the latest research and development to improve the Crown Trade Timonox upgrade system. The upgrade system is used in properties with more 10 coats of old paint, to achieve the Class 0 status required by law. Currently four coats are required to achieve the Class 0 status. However, a single coat of Crown Trade Timonox Upgrade Basecoat, followed by two coats of Timonox Emulsion topcoat will offer protection against the rapid spread of glames and improve a Class 4 surface to a Class 0. David Spicer, Crown Paints’ Specification Technical Manager, said: Providing the existing coatings are sound, Crown Trade Timonox can restore a surface to the Class 0 rating required by the legislation and can help by slowing down and limiting the spread of flames throughout a building, giving invaluable time for occupants to get to a place of safety. As well as the Crown Trade Timonox upgrade system for properties with more than 10 coats of old paint, Crown Trade offers a two coat overcoat system for surfaces with up to 10 coats of old paint. Furthermore, Crown Paints’ Specification Team offers a service to social housing clients, which involves a survey of surfaces to establish their classification status and advice on which Timonox system is required to achieve Class 0 in their properties.